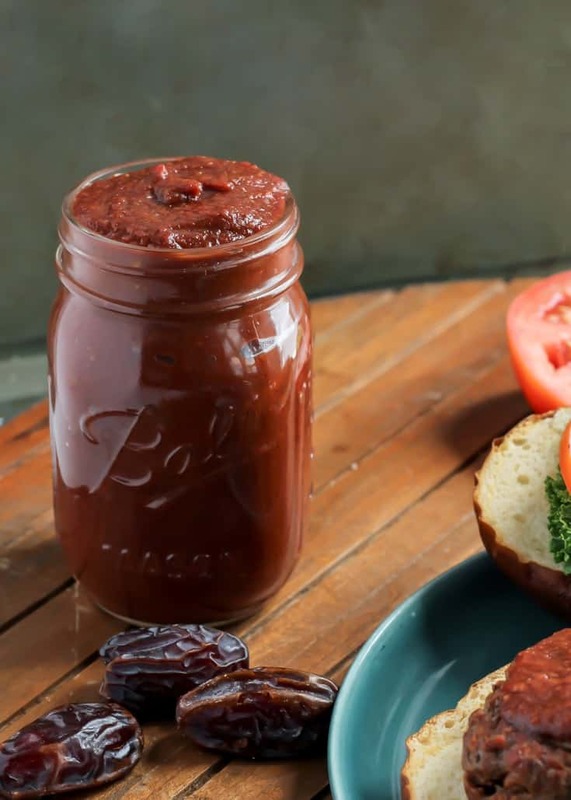 This Paleo BBQ Sauce is easy to make and sweetened with Medjool dates. Vegan, gluten-free, and no added sugars. This post is sponsored in partnership with Natural Delights Medjool Dates. All opinions expressed, as always, are my own. I only partner with brands who I trust and can recommend personally. Thank you for supporting Fit Mitten Kitchen! Something I turned my nose up at when I was a kid. Between ketchup, mustard, mayonnaise, BBQ sauce… I claimed I hated all condiments. It wasn’t until probably my early 20s I gave BBQ sauce a fair chance. And even then I was a little particular. 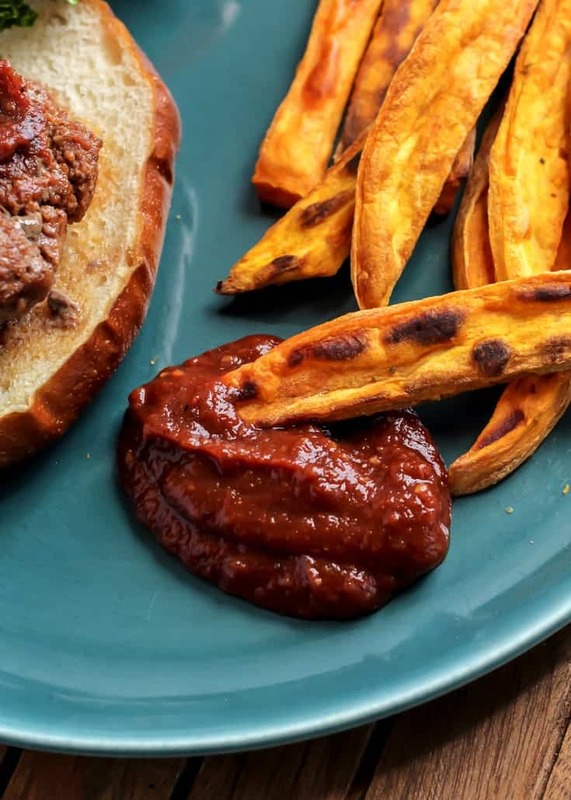 Alright I guess I am still a little particular… Which is why I wanted to try my hand at a paleo BBQ sauce with simple ingredients – no funny fillers or additives, or high fructose corn syrup. Now, I am not one to get all caught up in every.single.label anymore. But I like to keep an eye out for sneaky ingredients in my packaged foods. And BBQ sauce can be really sneaky! Especially if you don’t have access to more health-conscious brands. SO we make our own paleo BBQ sauce at home! And you guys, it is so much easier than you would think! And you really don’t need that many ingredients. Most of the flavor comes from the spices. 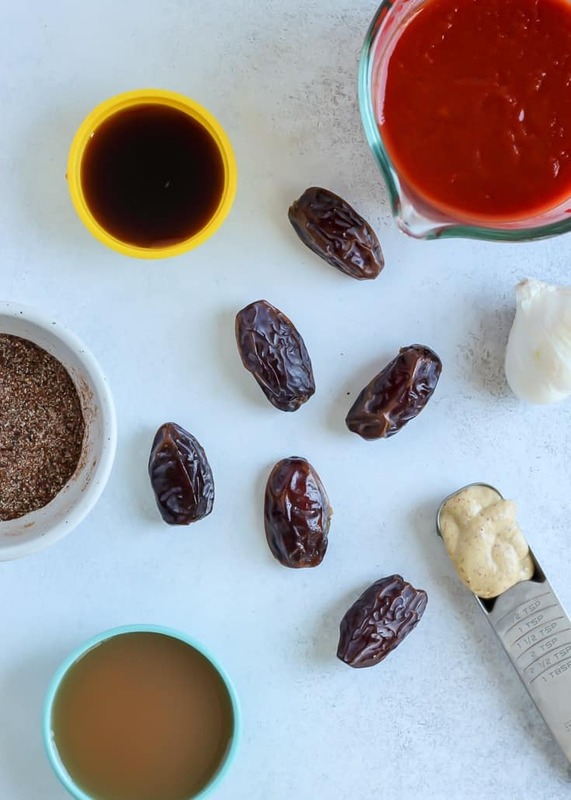 Some ingredients may be new to your pantry –coconut aminos or raw apple cider vinegar– but other than that its tomato based and sweetened with Medjool dates. Oh, did I mention it is vegan and also Whole30 compliant? Yes ma’am/sir. So it looks like a lot of ingredients but half of the ingredients are spices so don’t freak out, okay? Okay. They’re awesome in this recipe. All you have to do is combine all of the ingredients into a food processor or high-speed blender until smooth. Transfer the sauce into a pot and allow it to simmer for 20 minutes to intensify the flavor. 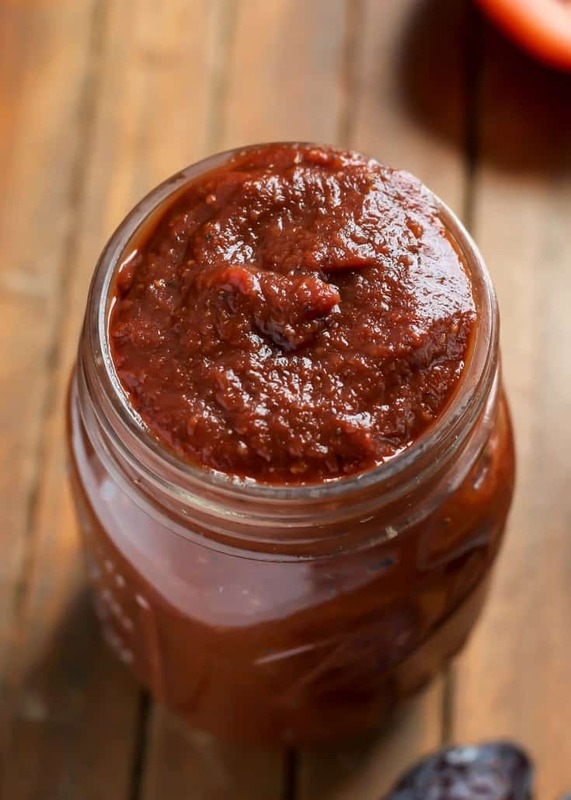 Let cool and transfer paleo bbq sauce to a jar. 1. In high speed blender or food processor, add all ingredients–making sure Medjool dates have been pitted, soaked and drained–and blend until smooth. 2. Transfer mixture to medium pot and allow to simmer for 20 minutes – BBQ sauce will become more flavorful and thicken slightly after simmering. 3. Remove from heat and allow BBQ sauce to cool in pot for 20 minutes. 4. 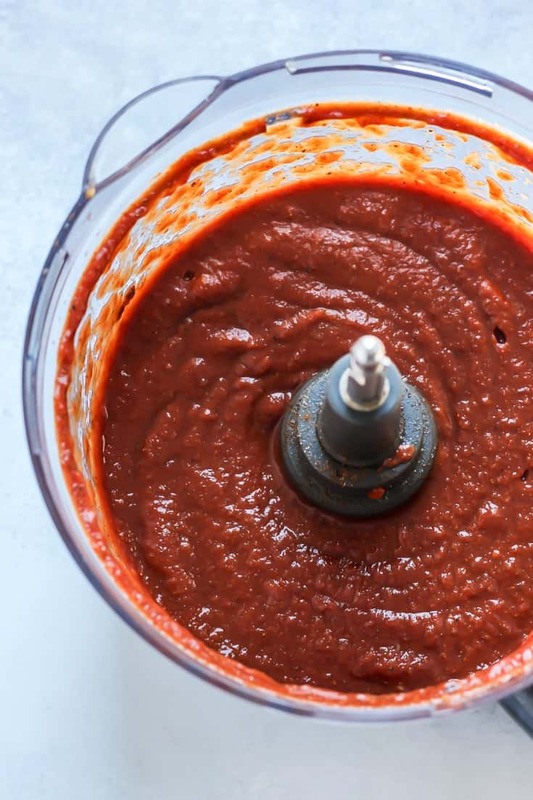 Transfer cooled sauce to 16oz jar– Option to strain BBQ sauce through fine mesh strainer for a smoother sauce, patting sauce with spoon or back of measuring cup to strain. 5. Store BBQ sauce in fridge – use within two weeks. Enjoy on your favorite burger, use for pulled pork, grilled chicken, or even great for dipping sweet taters! NOTE: This post contains Amazon affiliate links. If you choose to purchase through said links, this is at no extra cost to you. I will receive a small commission. Thank you for your support! This BBQ sauce sounds awesome! Using dates is one of my favorite tricks to sweeten foods without adding refined sugar. It is a lovely trick!! I used to love barbecue sauce, actually! I would have it on ribs, salads, chicken, with fries, you name it! Definitely got sick of it after a while, but I recently rekindled my love for it! Now, I enjoy it most on cauliflower pizza crusts and tofu! Anyhow, this Paleo take looks to die for! I can’t even believe it’s sweetened with dates! This BBQ sauce! Love that you used Medjool dates to sweeten it. I bet this tastes ahhmazing!! This recipe makes me so happy. I the condiment queen so I’m so glad you finally came to the realization of how amazing they are! My hubby and I are obsessed with BBQ sauce during grilling season but so many of the sauces contain high fructose corn syrup which we try to stay away from. We will be trying this one!!! Dates are a true wonder from Mother Nature! They have the ability to be so versatile and always delicious. I can’t wait to try this recipe, always looking to reduce added sugars! I never would have thought to use dates to sweeten BBQ sauce. Love that idea! Thanks Katherine! They really are super versatile. This looks incredible! Even though I am a pescatarian, I had actually love the flavor of barbecue sauce. So cool how you made this one healthier. Oh a BBQ glazed salmon would be really good! This sounds amazing! I love BBQ sauce and this one sounds like it’s got great flavor, and I love that you used dates to sweeten it. I was so the opposite as a kid – I loved barbecue sauce on anything! I still love it and enjoy making my own, but have never done a date sweetened one. This is genius! I was such a picky kid so it’s no surprise I didn’t like it then 🙂 But dates are definitely the best for this recipe! I would have never thought to use dates in BBQ sauce, but definitely need to give it a try now! Sounds absolutely delicious! Yes they really do make the best sweetener! So happy you have found a way to make paleo BBQ sauce! BBQ sauce is my favorite and I have been missing it a ton. Will definitely try this out soon! this recipe sounds amazing. I live in India and don’t know where to find coconut amino. is there any substitute for it? pls pls … tempting to make this tomorrow for the crowd ..
Saraiya! You can sub soy sauce or tamari if not worried about keeping it paleo. What would you use to thin it a bit? Probably just a little water!